One of the most prominent universities of the Qiqihar area is the Qiqihar Medical University. Quality education is provided by the university to the local students as well as to the students from other parts of the country or the world. For its medical education and research as well as its study in the province, the University has been widely appreciated. The University has been founded in 1946 and it is located in Qiqihar, Heilongjiang Province. QMU (Qiqihar Medical University) stands on the banks of the scenic river, Nenjiang. It is one of the older medical universities in China. It is a large coeducational higher education institution. QMU has established friendly interscholastic relationships with many universities in the United States, Philippines, Russia, Japan, etc. as it lays great emphasis on exchange and cooperation. QMU currently has a staff of 4,623 including 952 professors as well as associate professors and more than 71.9% of teachers with Master Degrees. The number of students taking the medical degree is 18,623. The undergraduate education program offers disciplinary orientations covering the four spectra of medicine as well as four other disciplines: science, engineering, law, and managing. There are the Post-doctoral Research Workstations, the Research and Development Lab and the Key Constructing Lab of Provincial Universities in the 22 research institutes and academic associations of the University. The university has undertaken 458 scientific research projects at different levels within the past 5 years. The campus of the University covers 6 affiliated hospitals, 8 schools, 4 practice-based schools, and 25 teaching hospitals. Qiqihar Medical University is one of the older medical universities in China and it is a premier institution of higher education in China. It is located in Qiqihar, Heilongjiang Province, in the Northeast part. QMU (Qiqihar Medical University) stands on the banks of the scenic river, Nenjiang and it is spread across 9.86 lakh square meters. In order to lower the linguistic difficulties while engaged in clinical practice, the University also provides clinical Chinese classes for free to third-year students. 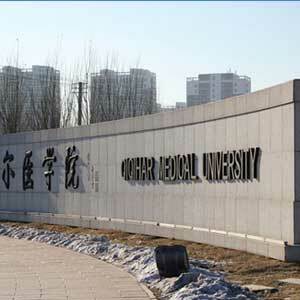 Journal of Qiqihar Medical University, Chinese Modern Nursing, and Nervous Diseases and Mental Hygiene, are the 3 Journals sponsored by the University which are issued domestically and abroad. Out of which Chinese Modern Nursing is the national publication and the others are the provincial publications. In September 2019 there will be starting date for applications and it will close on 30th October 2019. To deal with postdoctoral research programs, the University has ties with more than 20 research institutes. The Qiqihar Medical University provides 27 specializations categorized into 5 different disciplines. Those 5 disciplines are Medicine, Management, Science, Engineering, and law. For international students, exclusive bachelor degree programs are provided. Students must have completed 10+2 years of their education or any equivalent education with a minimum of 50% aggregate marks. Students should have Physics, Chemistry, and Biology as their main subjects of study.The applicant must possess a non-China nationality. Age of the applicant must be minimum 17 years and maximum 26 years. Students or applicants must have good academic records and should provide all the certificates at the time of admission. Applicant should have fluency in the English language. He/she should be physically and mentally fit. To study MBBS in Qiqihar Medical University, students who fit in the required eligibility criteria must fill the application form. Students must upload the required application documents. Students or applicants must be fully prepared with the photocopies or the scanned copies of the documents. Students or applicants should receive the admission letter or the invitation letter from the university in order to proceed for the MBBS admission at Qiqihar Medical University. The completed form and all the copies of the necessary documents should be submitted to the University by the candidate. The necessary application fees should be paid by the applicants. After tracking the admission status, students should get a proper visa and start their trip to the university. 100% scholarships on merit basis are available and also from 2nd year onwards, performance-based scholarships for students are available at this university. The Qiqihar University makes efforts of becoming a key national university in the near future and it has a rich history of academic excellence. By providing a beautiful and comfortable learning atmosphere, the University welcomes all the international students. At the Qiqihar Medical University, the accommodation for foreign students has standard rooms. These rooms are inclusive of a telephone, bathroom with water heater, an internet connection, a telephone, and an air conditioner etc. The accommodation charges are RMB 6000/year for a double room (two person sharing), RMB 3000/year for a Quad room (four-person sharing) and RMB 18000/year for a single room (single person sharing). Each student gets a study table, a bookshelf, a cupboard, a bed with a bed cover and a pillow. Indian food is being established at Qiqihar Medical University. Canteens provide delicious food at an affordable price to Indian students. For both vegetarian and non-vegetarian students, all type of food is available at the canteen. The food cost and other costs at Qiqihar Medical University are around Rs.6000-8000/month. Good quality education is offered by Qiqihar Medical University. For MBBS students in China, the cost of living is very low. At Qiqihar Medical University, an MBBS student can opt for various extra-curricular activities. An Indian student can get exposed to many cultures as students from many different countries come to study at Qiqihar Medical University. There is no hassle of admission exams or entrance exam in China and thus the admission process for MBBS at Qiqihar Medical University is quite simple. Students can pursue MBBS at Qiqihar Medical University at very low tuition fees. According to the World Health Organization and the Medical Council of India, Qiqihar Medical University is one of the best medical university. With various healthcare establishments, Student exchange programs are organized within China as well as outside it. Students can experience the welcoming and warm nature of local people of Qiqihar. The average cost of MBBS at Qiqihar Medical University is around Rs.2.78 Lakhs per year. This is because the other miscellaneous costs get added to the fees like Registration amount, Health Insurance, Textbooks, Resident permit etc. Thus, it is clear from the above information, that the total cost of MBBS in Qiqihar Medical University for Indian students is Rs.17-18 Lakhs which are very affordable course fees for medical studies. Students who want to go to China for their studies need to apply for student’s visa or X-visa. Only after receiving the JW202 Form from the applied university, students can apply for the X-visa or student visa. Then the students should go through study visa application in China Consulate or China Embassy in their country. Health Checkup Certificate sealed by the Government Hospital in Student’s country and duly signed by the doctor. The population of Qiqihar city is 5,611,000. The city covers an area of 43,000 square kilometers (16,602 square miles). It is located in the west-central part of the province and it is the second largest city in the Heilongjiang province of China. Qiqihar neighbors Inner Mongolia to the west and Jilin to the south and it is the traffic hub of western Heilongjiang. From the capital city Harbin, it is 359 kilometers (223 miles). At Qiqihar, the spring is dry and windy, and summer is hot and rainy and the city has a temperate continental monsoon climate at a high altitude. The winter is chilly and long and the autumn is shorter in Qiqihar. The average temperature of a year at Qiqihar is between 0.7-4.2°C (33.3-39.6°F) and the most favorable season to visit there is every year from May to July.